By TOM D'ANTONI // Kevin Burke has a solo concert at Alberta Rose Theatre on Saturday, March 17. St. Paddy's day of course! Back in the cupping room at World Cup Coffee and Tea at NW 18th & Glisan in Portland for another OMN Coffeeshop Conversation. When I do these things, it’s always nice to get to talk to people I’ve never met. Just as nice to renew acquaintances with people I haven’t talked to for a while. 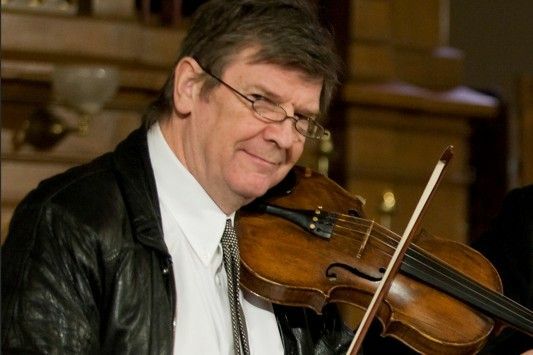 It’s been years since I’ve talked with famed Irish fiddler Kevin Burke. He is still travelling the world, he and his fiddle. He’s got a solo concert on St. Paddy’s Day at the Alberta Rose Theatre on Saturday, March 17. We’ll talk about that, about growing up Irish in London, England. Whether he was a Mod or a Rocker. And all things Irish fiddle. He’s lived in Portland for decades now and he’s sitting right in front of me. I was fortunate to see Kevin for the first time at Milwaukee Irish Fest a few years back. It was thoroughly enjoyable and I would go to see him again and as often as time permits. We are lucky to have him in our midst.